ST. GEORGE — At Dixie, the top-seeded Flyers built a four-touchdown lead in the first half, then held on to beat the Green Canyon Wolves, 42-21, in Friday night’s opening round of the 4A football playoffs. Dixie’s first points came less than a minute and a half into the game, when quarterback Reggie Graff scored on an 18-yard run. Josh Stewart added the PAT kick to give the Flyers an early 7-0 lead. Dixie went on to score three more TDs before halftime, taking a commanding 28-0 lead at the break. During the third quarter, however, Green Canyon rallied with three unanswered TDs to pull within seven points, 28-21. Midway through the third period, Dixie’s Tyson Miller caught a 14-yard TD pass from Graff to put the Flyers up 35-21. Then, early in the fourth quarter, Graff scored on a 37-yard run to pad the lead to 42-21, which ended up being the final score. Dixie’s defense made several key plays as well, including three interceptions by Harrison Beazer. Dixie hosts Spanish Fork in the 4A quarterfinals next Friday. 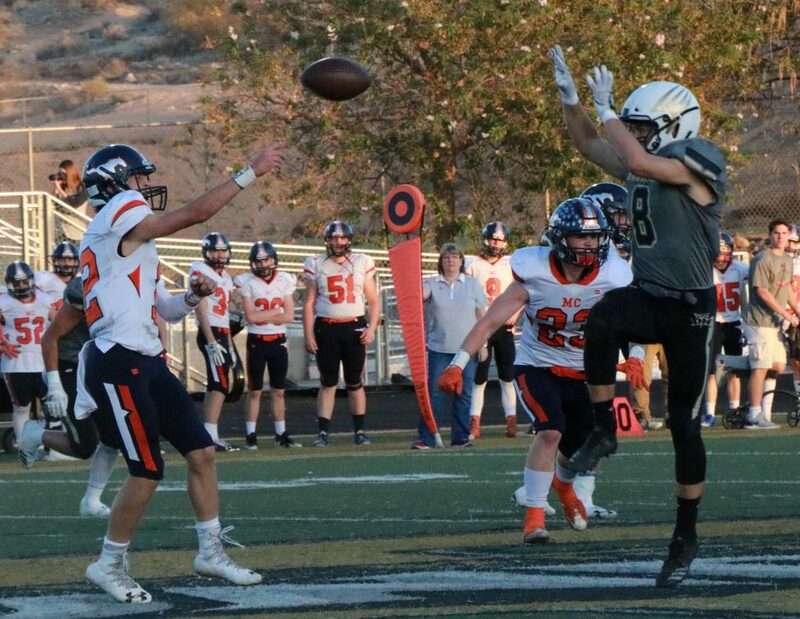 Down by 21 points with four minutes left in their opening round playoff game against Mountain Crest, the Desert Hills Thunder didn’t give up, scoring two late TDs to pull within seven points. However, the Mustangs were able to run out the clock on their final possession, depriving the Thunder a chance for any more last-minute heroics. “I do think if we could have gotten the ball one more time, who knows what would’ve happened. We just came up one short,” Desert Hills head coach Mark Murdoch said after the game. Murdoch said that even though his team was missing two running backs due to injuries, his players didn’t stop fighting to win. The two teams had battled evenly in the first half. Mountain Crest scored a TD on its opening drive, after which the Thunder answered with a scoring drive of its own, culminating in a 12-yard run by senior running back Saul Andrus. Early in the second period, Mountain Crest made it 14-7, thanks to a 2-yard scoring run by Brady Hall. 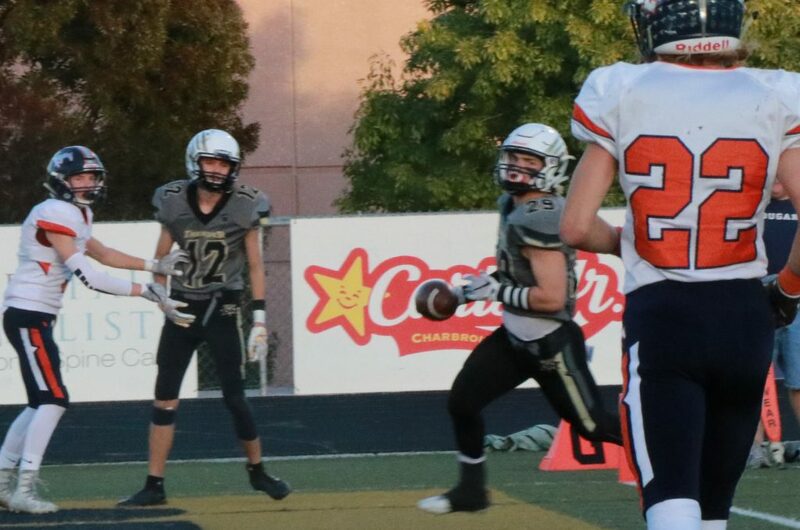 Desert Hills had another sustained drive late in the second quarter, but ultimately had to settle for a field goal when they fell two yards shy of a first down on the Mustangs’ 8-yard line. Down 14-10 at halftime, the Thunder then surrendered 17 straight points, as Mountain Crest kicked a field goal in the third quarter and added two more TDs. Ethan Wilson scored on a 4-yard run with 4:19 left in the fourth, giving the Mustangs a commanding 31-10 lead. The Thunder ran back the ensuing kickoff to the 48-yard-line, then followed that with an electrifying TD pass on its very next play from scrimmage. Quarterback Logan Wilstead tossed the ball straight left to halfback Bo Barden, who then heaved it deep into the end zone, where it was caught by Gage Baird for a TD, making it 31-17 with 4:01 left. Desert Hills then forced Mountain Crest to punt on its next possession, with the Thunder regaining possession of the ball with 2:32 remaining. After a couple long passes and an interference penalty, Wilstead scrambled 22 yards into the end zone for a TD that brought the Thunder within a touchdown, 31-24, with 1:27 left. The Thunder’s ensuing onside kick attempt went a little too far downfield, however, and Mountain Crest was able to recover the ball and run out the clock to end the game and Desert Hills’ hopes of advancing in the 4A playoffs. The Thunder ended their season with a 6-4 overall record.